What characterizes a well-executed Social Media Audit? What challenges can it pose for your company? What do experts not tell us? With the help of video and slides, etc., we discuss how small data can help you get to the bottom of things faster, while focusing on your ROI (return on investment). PLUS check out a FREE download of chapter 1. Watch the video in German. Gattiker, Urs E. (2014). Social Media Audits: Achieving deep impact without sacrificing the bottom line. Oxford, UK: Chandos (Elsevier Imprint). In addition the to the video below, we offer a presentation of the book, and most important, the first 55 pages as a free download, so you can easily peruse some of the content on your computer or mobile device. Thanks to Stephan Burckhart from Versio 2 (a real Inline Marketing expert), who conducted the interview with panache. Whenever I got sidetracked, he got me back on track asking the interesting questions that needed answers. Check it out, I think it is quite interesting – if I do say so myself. What about the book’s content? The book discusses a variety of topics in a systematic way, starting with strategic matters, such as setting goals so they can be measured, and ends with case studies illustrating how to conduct a social media audit. All of which is very necessary, as this slide from a National Public Radio test on Facebook illustrates. People are inundated with status updates and messages, so they fail to properly digest the content. Here the Social Media Audit can help improve resonance before it is too late. The book offers readers a variety of checklists, forms and tools to help evaluate the current situation. Taking an inventory gives one a baseline. In turn, such information provides one with the opportunity better allocate resources, leading to a bigger bang for your buck. To illustrate, many companies have one or two people who are responsible for all social media activities. They not only post but, as importantly, moderate comments and reply to readers. But can a blog comment languish in the moderation queue for four days? Unfortunately, it can, as illustrated below by the Digital Campus, Swissnex, San Francisco blog. Not a method we recommend to encourage engagement. Often people talk about wanting engagement, but what they strive for is the classic broadcasting model by sending their content, images or videos to as many people as possible. However, the question is, who wants to listen? As NPR showed, decreasing numbers of people do. The Social Media Audit is a starting point to getting it right. How should I conduct a social media audit in my company? The biggest advantage that a social media audit provides is that it forces one to clean house. Similar to a financial audit, you need to put the right structures and processes in place to get the most out of this exercise. Besides a strategy, we need objectives and targets that we can measure in order to evaluate how well we are doing. Of course, our social media objectives have to support corporate goals. How can social media help us achieve this goal? What unique contribution comes from Facebook or blog posts to reach this target? If content strategy helps improve my inbound marketing, then we might get a higher number of new leads and ultimately new clients. If not, what then? This theme was a central focus of my presentation for the Second Better Business Day, Konstanz #1, Freitag, 16.5.2014 conference. For your convenience, you can view the slides below – while in German AND English, I am sure you get my drift. Would you like to know how to use a social media audit to improve your company’s activities? No worries, I have uploaded the table of contents, preface, introduction, AND chapter 1, so you can view it below. Check out these 55 pages, FREE – pdf file for download from Slideshare. By the way, the book has two chapters that each describe from A to Z how we conducted an audit in two very different organizations: a bakery and a hospital. Check it out. If you wish to purchase this book to make it easy for your company to conduct an audit, here is a link from the author that provides you with an EXCLUSIVE 25 percent discount via the publisher (free shipping, of course)! Save at least €15 on the best Amazon price, guaranteed! If you have questions, want an interview or have another concern or idea, just contact the author (that would be me – see details below). – What changes did you implement with the help of the findings from a social media audit? – Do you have cases, examples or questions of how you could best use a social media audit in your company? 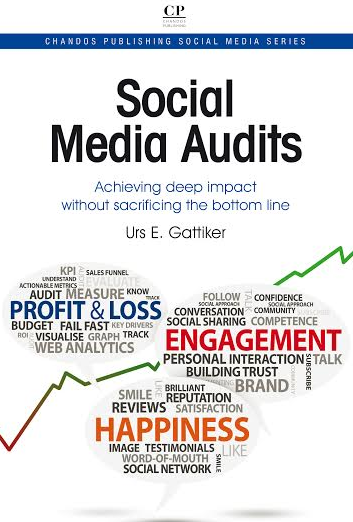 The author Urs E. Gattiker – aka DrKPI: His book, Social Media Audit: Measure for Impact, appeared in 2013 from Springer Science Publishers. His latest book, Social Media Audits: Achieving deep impact without sacrificing the bottom line was published in April 2014 by Chandos Publishing / Elsevier – blog readers => grab your 25 percent discount with free shipping now. ← re:publica 2014: Where is the beef? Thank you for permitting a peek at your new book. I like the automobile analogy, and look forward to seeing how it plays out, throughout the book. Best of luck with book #2! Thanks so much for your feedback. And of course, you are welcome. I hope you have a look at my book. What I like are the checklists that help me and our tem with the actionable metrics…. KPIs in particular. Yes the auto analogy is not too bad 🙂 I have to concurr to you on this one. A useful bridge that makes it more real for all of us since we have all experienced flat tires, gased up at the wrong pump, forgot to put in more windshield cleaner and so forth. I hope things are going well with you and please stay in touch. I looked at both books, Urs, and think I’d better start with the first one! Right now, I have too many websites, so am concentrating on getting one that is sound – with a blog, of course! – and pointing other URLs to that. I’m active on Facebook & Twitter, less so on LinkedIn and Google+. I’ll let you know where I end up! In that case I suggest you start with the checklists… hopefully they will guide you with one or two of your many sites. Otherwise we have to help you from over here.